What Are the Puffer Fish's Enemies? The pufferfish, or tetraodontidae, can be found in tropical and subtropical ocean waters and is known for its ability, when threatened, to inflate and make itself inedible to predators. Some species also expose sharp spines and contain powerful toxins that can kill ocean predators or humans. There are more than 120 species of pufferfish. Sharks, specifically tiger sharks, are one of the species that eat pufferfish. They are found in tropical and subtropical waters throughout the world. Tiger sharks--named for the stripes on their backs--are known for their undiscerning palate, meaning they eat anything they come across, even garbage. The pufferfish is not a strong swimmer and most species do not have natural camouflage, making them an easy target for the scavenging tiger shark. Sea snakes are another species that will eat pufferfish, and they belong to the cobra family of snakes. A sea snake can stay underwater for up to an hour without air. They are found in the Indian Ocean and the Pacific Ocean's warm waters. Sea snakes are very poisonous and will bite when threatened. The pufferfish is not a strong swimmer and most species do not have natural camouflage, so the sea snake will hunt them out in the ocean. Sea snakes are not bothered by the pufferfish's toxin. Pollution and habitat loss caused by changing ocean temperatures are another threat to pufferfish populations. Because they consume algae, pollution can have a major impact on the food that is available to them. Some of the species of pufferfish are considered vulnerable enough to become endangered because of pollution, but most pufferfish populations were stable in 2011. 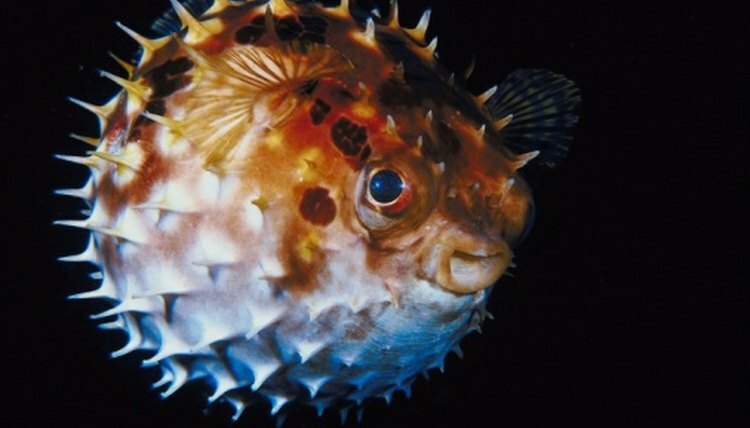 Humans are another predator of pufferfish. The pufferfish's flesh is considered a delicacy, despite the fact that its toxin is 1,200 times more poisonous to humans than cyanide. It is popular with adventurous eaters because it is synonymous with risk taking, and a small amount of the toxin is believed to cause a state of euphoria in diners. Humans can also damage the pufferfish population through overfishing, but most pufferfish populations were stable in 2011.